Thursday, April 25, 2019 • R.I.P. Edition • For when you've got nowhere else to go. There were dreams, there were warnings, there were omens… all of them announcing the return of Anton Arcane. Now Swamp Thing must fight one last time against his nemesis in “The Brimstone Ballet” (published in Saga of the Swamp Thing # 31 in December 1984). Who will triumph?, the monster with a human soul or the soulless human? Abigail’s heart has stopped beating. With a delicacy that behooves his gentle soul, although not his monstrous physique, Swamp Thing has removed Abby’s body from Arcane’s house. But he can neither bring her back to life nor rescue her soul. Not content with the physical extermination of Abigail, Arcane has condemned an innocent life to hell. And now, Arcane is ready to finally destroy his old rival, Alec Holland. Except, as Swamp Thing explains, he is no longer Alec Holland, in fact, he never was Holland. He is a force of nature, an elemental creature. And the swamp has never been Arcane’s territory, the swamp and every other ecosystem on Earth are now the realm of the Swamp Thing. And thus, Arcane is fiercely attacked. In the heat of battle, Matt Cable, Abby’s husband, finally regains control over his body, and decides it’s time to break the deal he made with the devil. In order to win, he must sacrifice himself; because his physical extinction will also mean the dead of Arcane. Guest artist Rick Veitch creates a very strong atmosphere, overflowing with aggressiveness. Veitch’s pencils acquire a unique somberness thanks to John Totleben’s inks. Together, they masterfully deliver this long awaited violent and final confrontation. Matt’s final words are especially revealing: “There isn’t any evil Alec… no special blackness reserved for demons and monsters. There’s just weakness… I had a choice…” Indeed, Matt always had a choice. Instead of helping Abby he spent the last years of his life drinking. Alcoholism, perhaps, is a form of weakness. And it is that same weakness that forced Matt to accept Arcane’s atrocious proposal. Not long ago, Swamp Thing had been able to transfer his mind to the Green. He’s part of nature now, and he wonders if he can now transmit his conscious-ness far beyond the Green, into the land of the dead. And that’s how “Down Amongst the Dead Man” (Swamp Thing Annual 1985) commences. The splash page, by Stephen Bissette and John Totleben has a very lyric beauty; the peacefulness of Abby’s body is complemented by the tranquility of the plants and trees that surround her; at the same time, the severe expression of Swamp Thing adds an ominous shadow to an otherwise idyllic landscape. In every culture, in every era, different civilizations have had different visions of the underworld. In recent times, however, the Judeo-Christian vision of hell has prospered and eclipsed all other alternatives. The Nifleheim of the Vikings or the Tartarus of the Greeks have been replaced by the image of demons and everlasting flames. Alan Moore confirms, however that if hell is a state of mind, then there are as many hells as people on Earth, so he combines elements from different legends and traditions and, what’s even more surprising, from DC’s own supernatural mythology. The journey begins in the land of the recently deceased, where a solicitous Deadman (Boston Brand) helps guide people in the right direction. 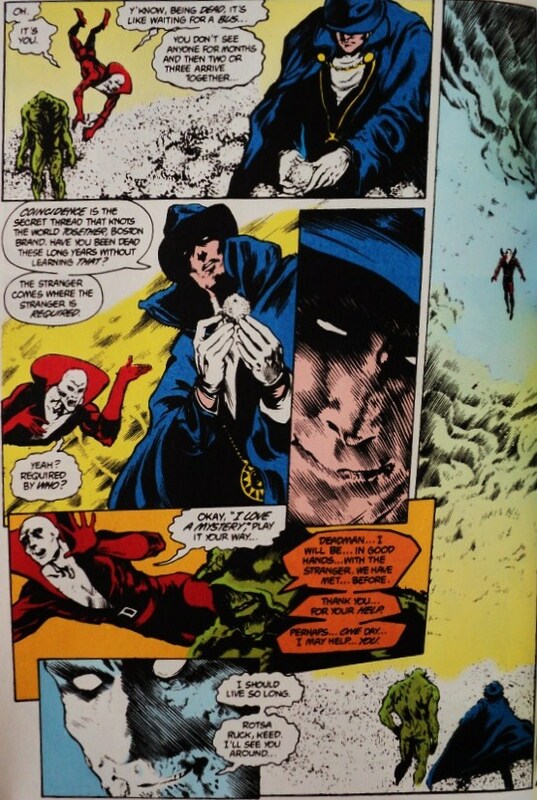 Deadman answers Swamp Thing’s questions and accompanies him to the limits of this region, then and only then does the ever mysterious Phantom Stranger appear. 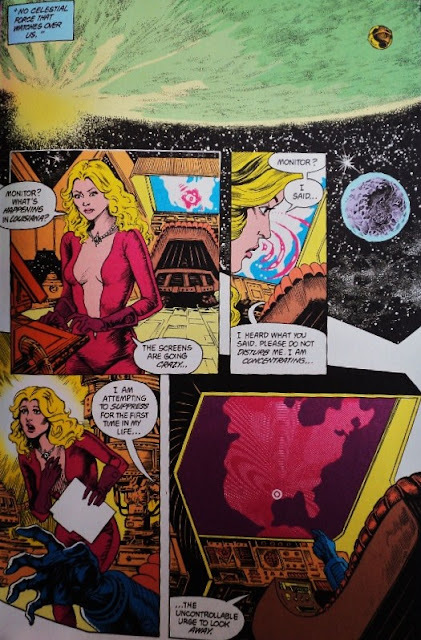 The Phantom Stranger and Swamp Thing walk through several heavenly regions, and it’s there that they find Alec Holland who informs them that Abby is not in paradise. But before descending to hell, the Phantom Stranger must request an audience with The Spectre, a sentinel of form, reason and logic whose unlimited power has never been fully tested. “The ordered universe is but a microscopic bubble in an ocean of seething madness”, explains the Phantom Stranger. For the Spectre, the law is the law, and Abby’s soul cannot be extracted from hell. 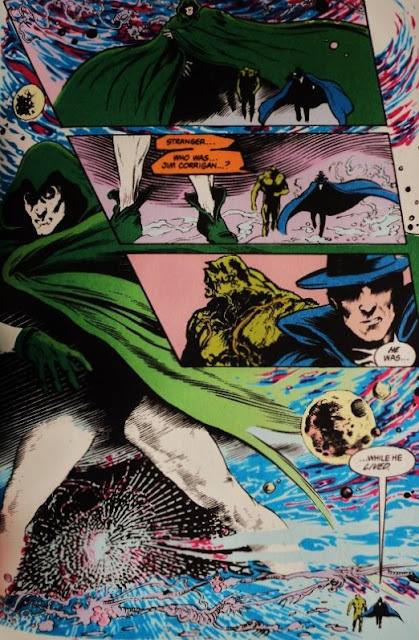 Nevertheless, the Phantom Stranger reminds the Spectre that long ago he was a human named Jim Corrigan, and should the rules apply to him then the Spectre wouldn’t exist. Therefore, the Spectre authorizes this journey. Bissette and Totleben draw the Spectre as a larger than life creature, an infinite humanoid form bigger than planets, that defies the “seething madness” and universal chaos with his rictus of sternness and his lifeless paleness. The Phantom Stranger cannot go through the Gates of Hell. “Each soul must enter alone… otherwise, how could it truly be hell?”. Fortunately for Swamp Thing, the Demon Etrigan is willing to aid him in his search… for a price, of course. The Phantom Stranger worries about breaking the rules, as Swamp Thing should travel unaccompanied. 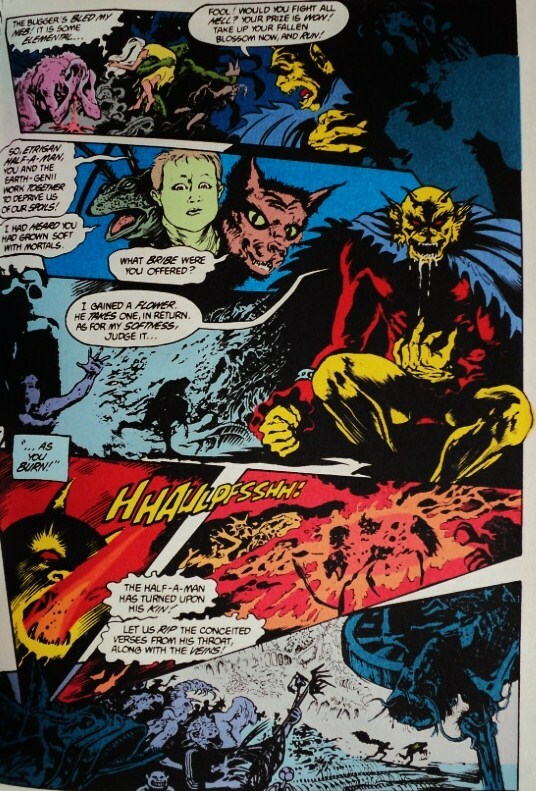 Etrigan, nevertheless, mocks him “The rules? And if I break these rules, pray tell shall I be punished? Sent perhaps to hell?”. Bissette and Totleben design a hell that is both scary and alive, in constant turmoil and change. Bissette’s visual imagination takes us swiftly to a place of putrefaction and atrocity, a place so terrible that even Arcane can’t resist the torment of thousands of insects nesting in his skin. He asks Swamp Thing how many years of torment has he endured, and the answer makes him scream in agony: “since yesterday”. Finally, after struggling with other demons and thanking Etrigan for his help, Swamp Thing rescues the soul of Abigail. Like Jamie Delano describes in his prolog: “swollen torrents of words have roared under many bridges; oceans of exotic imagery have swirled and risen”. Indeed, Alan Moore writes one the most intense and creative stories I’ve ever read about hell, and he takes advantage of many of DC’s characters. He builds upon every conceivable idea of hell and the truly magnificent art of Bissette and Totleben turn his vision into a masterwork. Hubo sueños, hubo advertencias, hubo presagios... todos anunciaban el retorno de Anton Arcane. Ahora Swamp Thing debe luchar una última vez contra su némesis en "El ballet de azufre" (publicado en "Saga of the Swamp Thing" # 31 en diciembre de 1984). ¿Quién triunfará? ¿El monstruo con alma humana o el humano sin alma? El corazón de Abigail ha dejado de latir. 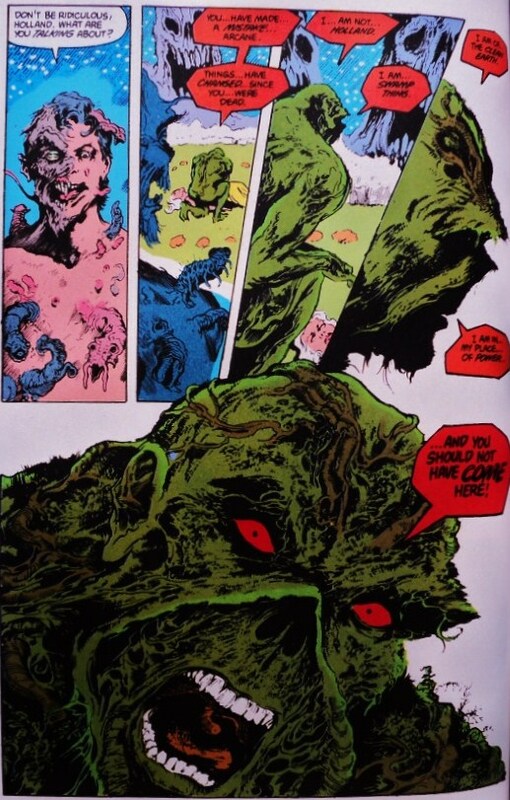 Con una delicadeza propia de su alma gentil, aunque no de su monstruoso físico, Swamp Thing ha extraído el cuerpo de Abby de la casa de Arcane. Pero no puede ni resucitarla ni rescatar su alma. Insatis-fecho con la extinción de Abigail, Arcane ha condenado una vida inocente al infierno. Y ahora, Arcane está listo para destruir por fin a su viejo rival, Alec Holland. Excepto que, como explica Swamp Thing, él ya no es Alec Holland, de hecho, nunca lo fue. Él es una fuerza de la naturaleza, una criatura elemental. 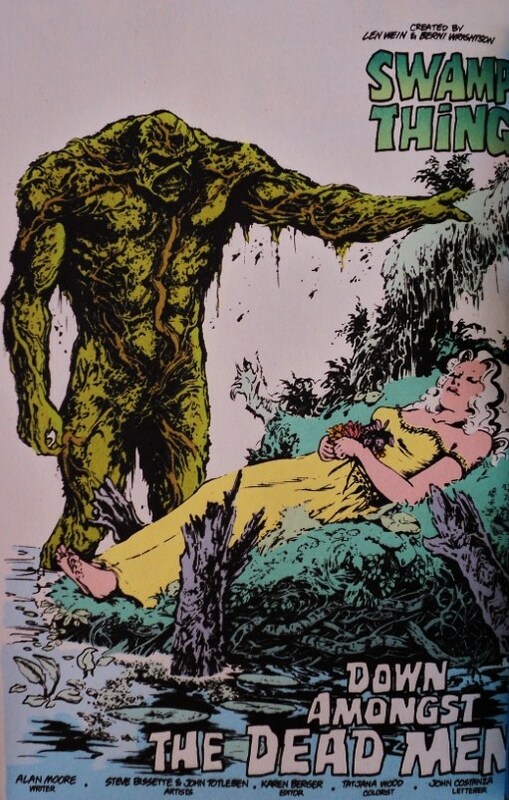 Y el pantano nunca ha sido territorio de Arcane, el pantano y todos los ecosistemas de la Tierra son ahora el reino de Swamp Thing. Y de este modo, Arcane es atacado con fiereza. En el calor de la batalla, Matt Cable, el esposo de Abby, recupera por fin el control sobre su cuerpo, y decide que es el momento de romper el trato que ha hecho con el diablo. Para ganar, debe sacrificarse a sí mismo; porque su extinción física también significará la muerte de Arcane. El artista invitado Rick Veitch crea una atmósfera muy fuerte, repleta de agresividad. Los lápices de Veitch adquieren un tono sombrío gracias a las tintas de John Totleben. Juntos, entregan con maestría la esperada y violenta confrontación final. Las palabras finales de Matt son más que reveladoras: "No existe la maldad Alec... no hay una negrura especial reservada para los demonios y los monstruos. Sólo hay debilidad... Yo tuve una opción..." De hecho, Matt siempre tuvo una opción. En vez de ayudar a Abby gastó sus últimos años tomando. El alcoholismo, tal vez, es una forma de debilidad. Y es esta misma debilidad la que obligó a Matt a aceptar la atroz propuesta de Arcane. No hace mucho, Swamp Thing había sido capaz de transferir su mente al Verde. Él es parte de la naturaleza ahora, y se pregunta si puede transmitir su conciencia más allá del verde, hacia la tierra de los muertos. Y así es como comienza "Abajo entre los hombres muertos" (del anual de Swamp Thing de 1985). La página inicial de Stephen Bissette y John Totleben tiene una belleza lírica; el pacífico cuerpo de Abby es complementado por la tranquilidad de las plantas y los árboles que la rodean; al mismo tiempo, el gesto adusto de Swamp Thing añade una sombra ominosa a un paisaje que, de otro modo, sería idílico. En cada cultura, en cada era, diferentes civilizaciones han tenido visiones distintas del inframundo. En épocas recientes, sin embargo, la visión judeo-cristiana del infierno ha prosperado y ha eclipsado a todas las otras alternativas. El Nifleheim de los vikingos o el Tártaro de los griegos han sido reemplazados por imágenes de demonios y de candela eterna. Sin embargo, Alan Moore confirma que si el infierno es un estado mental, entonces hay tantos infiernos como personas en la Tierra, así que combina elementos de las diferentes leyendas y tradiciones y, más sorprendente aún, de la propia mitologías sobrenatural de DC. La travesía empieza en la tierra de los recién fallecidos, en donde un solícito Deadman (Boston Brand) ayuda a guiar a la gente en la dirección correcta. Deadman responde las preguntas de Swamp Thing y lo acompaña a los límites de esta región, entonces y sólo entonces, aparece el misterioso Phantom Stranger. Phantom Stranger y Swamp Thing caminan por varias regiones celes-tiales, y es allí en donde encuentran a Alec Holland quien les informa que Abby no está en el paraíso. Pero antes de descender al infierno, Phantom Stranger debe solicitar una audiencia con Spectre, un centinela de la forma, la razón y la lógica con poder ilimitado. "El universo ordenado no es más que una burbuja microscópica en un océano de calcinante locura", explica Phantom Stranger. Para Spectre, la ley es la ley, y el alma de Abby no puede ser sustraída del infierno. No obstante, Phantom Stranger le recuerda a Spectre que en el pasado él fue un humano llamado Jim Corrigan, y si acaso las reglas se aplicasen a él, entonces Spectre no existiría. Por lo tanto, Spectre autoriza este viaje. Bissette y Totleben dibujan a un Spectre más grande que la vida, un humanoide infinito más grande que los planetas, que desafía la "calcinante locura" y el caos universal con su rictus de severidad y su palidez sin vida. Phantom Stranger no puede cruzar las puertas del infierno. "Cada alma debe entrar sola... de otro modo, ¿cómo podría ser el infierno de verdad?". Por fortuna para Swamp Thing, el demonio Etrigan está dispuesto a ayudarlo en su búsqueda... por un precio, desde luego. Phantom Stranger se preocupa por romper las reglas, ya que Swamp Thing debería viajar sin compañía. Etrigan, no obstante, se mofa de él "¿Las reglas? Y si rompiese aquellas reglas, decidme, ¿sería castigado? ¿Enviado, quizás, al infierno?". Bissette y Totleben diseñan un infierno con vida y que asusta, en constante turbulencia y cambio. La imaginación visual de Bissette nos lleva con velocidad a un lugar de putrefacción y atrocidad, un lugar tan terrible que ni siquiera Arcane puede resistir el tormento de miles de insectos incubando en su piel. Él le pregunta a Swamp Thing cuántos siglos de tortura ha soportado, y la respuesta lo hace gritar en agonía: "desde ayer". Por fin, luego de luchar con otros demonios y agradecer a Etrigan por su ayuda, Swamp Thing rescata el alma de Abigail. Como Jamie Delano describe en su prólogo: "torrentes hinchados de palabras han rugido bajo muchos puentes; océanos de imaginería exótica se han arremolinado y alzado". De hecho, Alan Moore escribe una de las historias más intensas y creativas que he leído sobre el infierno, y además aprovecha muchos de los personajes de DC. Desarrolla todas las ideas concebidas acerca del infierno y al arte magnífico de Bissette y Totleben hacen de esta visión una obra maestra.